After posting my red cup meme image yesterday, I saw the new report below, so why not make another image showing an actual red problem that should be getting attention and controversy instead of festive cups?? A new report from the World Meteorological Organization shows that the global average concentration of carbon dioxide crossed above 400 parts per million for the first time in spring 2015. In spring 2014, carbon dioxide concentrations in the northern hemisphere crossed the symbolic 400 ppm level, but this is the first time it has been recorded as a GLOBAL AVERAGE. The New York Times also reported on the new WMO greenhouse gas bulletin that covers the 2014 data. But Dr. Tarasova noted that exceeding the 400 mark does not denote an immediate catastrophe. 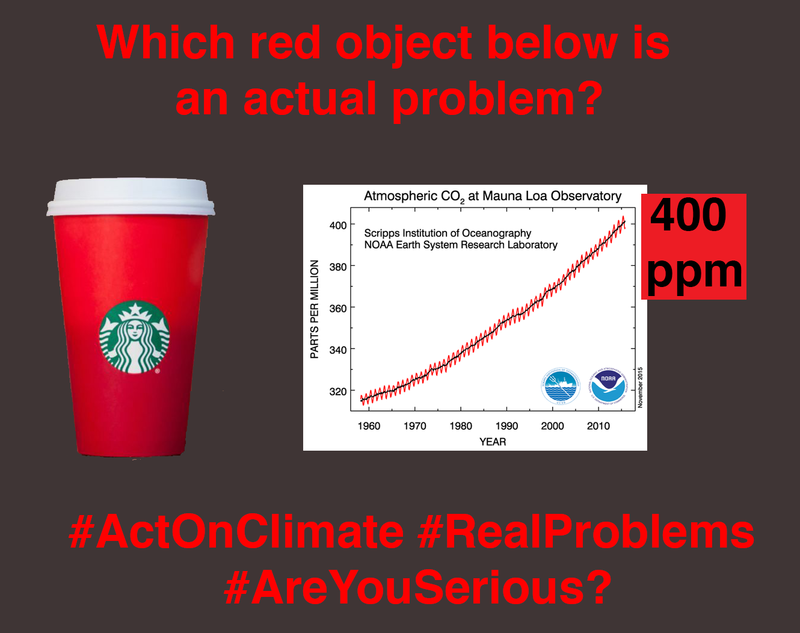 Image above includes the controversial red cup from Starbucks and a graph of carbon dioxide recording from NOAA showing CO2 going above 400 ppm. Based on my post from yesterday. I couldn’t find an updated graph showing global average above 400, this shows a northern hemisphere recording to Nov 2015 – and I think it gets the point across.